Huey Lewis and The News have been defying the rock oddsmakers for three decades. 2009 marks the group’s 30th anniversary. Formed from two rival Bay Area bands in 1979, their contagious brand of straight-ahead rock n’ roll has outlasted countless trends, selling over 20 million albums worldwide in the process. Huey Lewis & The News have carried the banner as the quintessential American rock band, endearing them to millions of fans and earning them the right to mark their place on the pop history map. These Grammy Award winners have written and performed such classic Top Ten Hits as “Heart of Rock & Roll”, “Stuck With You”, “I Want A New Drug”, “If This Is It”, “Hip To Be Square” and “Workin’ For A Livin’”. The group also wrote and performed “The Power of Love” and “Back in Time” for the hit film Back To The Future. “The Power of Love”, which was nominated for an Academy Award, went all the way to #1 on Billboard’s singles chart. As great a recording career as the band has had, it’s their live performances that remain the stuff of legend. They have toured worldwide continuously for 30 years. 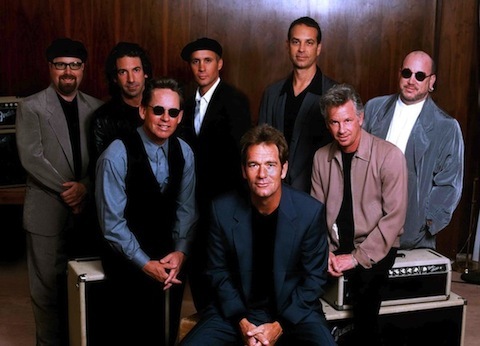 Huey Lewis & The News incorporate a variety of musical influences, including R&B and soul, to create their own unique sound. One of the highlights of their show is their a cappella rendition of early rock n’ roll classics such as “Sixty Minute Man”, “Under The Boardwalk” and “It’s Alright”. Huey Lewis & The News are: Huey Lewis (vocals and harmonica), Johnny Colla (saxophone, guitar and vocals), Bill Gibson (drums, percussion and vocals), Sean Hopper (keyboards and vocals), Stef Burns (guitars and vocals) and John Pierce (bass). Their live show features a horn section of San Francisco bay area luminaries: Marvin McFadden (trumpet), Johnnie Bamont (baritone saxophone) and Rob Sudduth (tenor saxophone).